The John and Lyn Lofland Undergraduate Research Award honors excellence in undergraduate research in sociology. Undergraduate research gives students an opportunity to apply sociology to questions about social life. Through research, students can demonstrate skills in formulating questions, drawing conclusions from findings, and fine-tuning arguments. Undergraduate research can give students a valuable first experience in conducting an original, in-depth scholarly investigation. The Lofland Award celebrates John and Lyn Lofland's contributions to sociology and in particular to the undergraduate sociology program at the University of California, Davis. 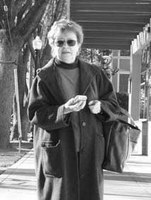 John joined the UC Davis faculty in 1970, and Lyn arrived the following year. They were instrumental in creating many of the defining features of our undergraduate program. They helped establish the Sociology Honors Program, the research assistant program, undergraduate seminars, and the Davis-based Upsilon chapter of Alpha Kappa Delta, the International Sociology Honor Society. The Undergraduate Research Award celebrates these and the many other improvements that John and Lyn made to the Sociology program at UC Davis. The winner of the award receives a prize of $500 and their name is commemorated on a department plaque. In addition, the winner is invited to attend the Department of Sociology Honors Reception, where the award is presented and publicly recognized before an audience of faculty, staff, and students. One or more additional papers may be awarded an honorable mention, and their authors will be invited to the celebration for public recognition. To be eligible for the award, papers must be authored by sociology or sociology-organizational studies majors, and must be nominated by a Department of Sociology instructor. Students should initiate the process by requesting an instructor to nominate their paper. Papers must have been written during the preceding calendar year, must be formatted per American Sociological Association manuscript style guidelines, and may not be nominated more than once. Submissions are accepted each spring quarter until June 1. Download and fill in the nomination form and email it, along with a copy of the paper, to Caroline Herrod. Only papers for which a nomination form has been submitted will be reviewed. The nominator's name should appear on the cover page along with the student's name and the title. Papers written as honors theses, upper division seminar papers, theory papers, directed or independent study papers, McNair theses, or term papers are all eligible. Papers must be based upon original research. These are the winners of the Undergraduate Research Award Winners prior to the naming of the Lofland Award. 1993 — Ronald Ruggiero: "Reform in Retreat: France, 1981–83." John and Lyn Lofland, along with current and former members of the UC Davis Department of Sociology, generously donated funds to establish and endow this award. Please consider joining us in contributing to the Lofland Undergraduate Research Award by filling out the online gift form.